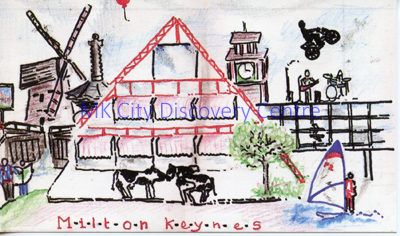 Postcard produced as part of the Design-a-Postcard Exhibition, which was organised by the Milton Keynes Environmental Education Group and held at Milton Keynes Library in 1986. Shows a drawing of various landmarks, including The Point, Concrete Cows, windsurfing, Bradwell Windmill, Neath Hill clock tower and the shopping centre. Designed by Sophie Edwards, aged 13, from Brindley Hall, Stantonbury Campus.